Funky little Napier, in the Hawke's Bay region, is the Art Deco capital of the world. In 1931, a devastating earthquake shook the town to its core, and the mammoth rebuilding project was completed in the then highly-fashionable Art Deco style. Today, these well-preserved buildings are all nationally protected monuments and give the central town a distinct, colorful character that is unique in New Zealand. Architecture and history fans will enjoy soaking up the 1930s flavor of the streets here. The Hawke's Bay region is the country's fruit bowl, and the surrounding rolling countryside is packed with orchards and vine-draped fields that sum up New Zealand's gently rural appeal. It's a great region for a road trip through sleepy backwater villages and hilly farmland, with the jutting peninsula of Cape Kidnappers and its superb gannet colony a definite highlight of a journey here. Napier's shattering earthquake of 1931 leveled the center of town, and rebuilding afterwards was largely focused on the Art Deco and Spanish-mission styles, which were then in fashion in the United States. 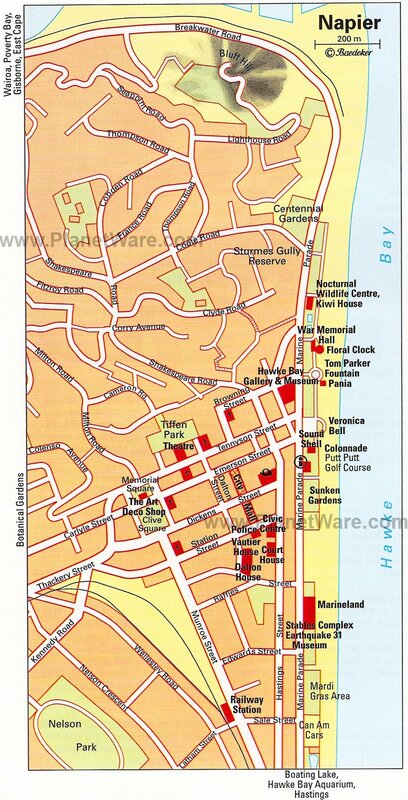 The result is an incredible assemblage of Art Deco architecture (comparable only with the Art Deco District of Miami) that has given Napier the moniker "Art Deco capital of the world." Much of the design was the work of local architect Louis Hay who infused Maori motifs into many of the building facades to give the architecture a distinctly New Zealand twist. Of particular note among the many Art Deco buildings in town are the Masonic Lodge and the Criterion Hotel. Today, the city's architecture is its biggest tourist attraction, and a highlight of a stay here is taking one of its Art Deco Walks run by Napier's Art Deco Trust. The trust can also arrange bike tours and vintage car tours and, for those who want to explore independently, sell a handy self-guided tour booklet. The National Aquarium of New Zealand is home to the country's most diverse range of sea life. In the Oceanarium, visitors can view the shark species, stingray, and reef fish that call the waters off Hawke's Bay home, as well as plenty of tropical fish, turtles, and octopi that are found throughout the Pacific. There are also three animal enclosures that allow you to see some of New Zealand's most famous endemic animals: the nocturnal and flightless kiwi, the tuatara reptile, and the little blue penguin. Kids will enjoy the close-encounters experience in the Penguin Enclosure, which lets them hand-feed these charismatic creatures. Napier's seafront promenade of Marine Parade is lined with tall Norfolk Pines and is home to the tranquil Marine Parade Gardens and the Sunken Gardens. There are plenty of monuments and art installations to spot along this stretch, the most famous of which is the bronze Pania of the Reef statue. Mermaid-like Pania is a figure from Maori mythology who was lured away from her lover by the sea people and was unable to return to dry land. Other monuments worth a look include the Spirit of Napier monument, the Tom Parker fountain, and Marine Parade Arch with the ship's bell from the HMS Veronica, which was the first source of help after the 1931 earthquake. If you're in New Zealand during February, don't miss Napier's Tremains Art Deco Weekend where the city celebrates its profusion of Art Deco architecture with a 1930s-themed festival. There are vintage car parades, fashion shows, outdoor music concerts, and Great-Gatsby-themed picnics and dances. Locals as well as visitors take the chance to dress in flapper-era glory for all of the events, and the streets are filled with people sporting 1930s-style chic. More than 40,000 people attend the festival, which runs for four days every year. This 40-hectare pa (Maori fortified village) is one of New Zealand's most important archaeological sites. Otatara Pa was the largest pa in the Hawke's Bay region and was home to the chief, Turauwha, who dominated the region. Today, the pa is a historical reserve, and excavation and careful preservation here means that many of the foundations of terraced dwelling sites and food pits can be seen. The hill the pa sits on has excellent panoramas of the surrounding countryside down to Napier and across to Cape Kidnappers. On a clear day, the views stretch out to Mount Ruapehu in the distance. Just south of Napier, the headland of Cape Kidnappers juts out into the sea and is a viscerally beautiful place of stark, windswept cliffs shooting up from narrow strips of beach. Cape Kidnappers was given its name by Captain Cook in 1769 when the local Maori here, trading with Cook's ship, kidnapped his Tahitian cabin-boy. Today, this craggy peninsula lays claim to being home to the world's largest gannet colony with the birds easily seen nesting in huge numbers. Tours by tractor along the beach are easily arranged, or independent travelers can hike along the beach for eight kilometers from the town of Clifton. This excellent museum and art gallery is a showcase of the Hawke's Bay region and a must-do for history fans who want to find out more about the famous Napier earthquake of 1931. The permanent collection includes a gallery devoted to the earthquake that explains the devastating effect on the area and the mammoth rebuilding project afterwards. Other exhibitions include a well curated Maori gallery displaying jewelry, carving, and clothing and an art gallery with an emphasis on New Zealand's 20th-century artists. There is also an impressive natural history collection with moa (New Zealand's extinct giant bird) bones and materials. Walkers who want to get a good view across Napier and its dazzling blue bay should take a hike up Bluff Hill. Just to the north of Napier's town center, the Bluff Hill Domain area has a winding trail up to a lookout point, which was manned by an army coastal regiment during World War II. Today, the lookout provides incredible panoramas that extend as far as the Mahia Peninsula in the northeast and to Cape Kidnappers in the southeast on a clear day. A plaque at the lookout commemorates the battery that once stood here. Napier's St John's Anglican Cathedral was first built in 1886, but the present building was constructed between 1946 and 1965 and is a thoroughly modernist-style piece of church architecture. It is noted for its stained-glass ambulatory windows that depict scenes from the life of Christ in an abstract-design style. Also worth viewing are the Stations of the Cross paintings by New Zealand artist Phyllis Simmonds and the cathedral's 48 wooden plaques carved with Christian symbols that adorn the ambulatory walls. The cathedral is open to visitors daily and provides a brochure detailing the church's architecture so that visitors can self-guide around the building. Beside the town of Havelock North, Te Mata Peak rises 339 meters above the surrounding countryside, allowing sweeping views across the entirety of Hawke's Bay. Te Mata Peak is significant in Maori folklore and is the setting for the legend of Chief Te Mata O Rongokako, who, to win the hand of his lover, tried to eat his way through the cliffs here. The park area covers 99 hectares with native forest as well as gum trees, eucalyptus, and redwood forest areas. A large network of hiking and mountain biking trails traverse the area up to the summit and make a great place for an afternoon stroll with plenty of scenic viewpoints along the way. Those not so keen on a walk can also reach the summit by road. Napier Prison is New Zealand's oldest prison, founded in 1862 and finally closing its doors in 1993. Once home to many of New Zealand's most notorious inmates, the prison buildings today are home to a fair whack of ghost stories and are open for visitors to experience the history of incarceration here, including visits to the cells, quarry, hanging yard, and cemetery. For many travelers it's the tales of hauntings and strange occurrences that are most fascinating, and specialised ghost walks take place in the evenings. For those that prefer exploring in the daylight, self-guided audio-tours are provided on entry. Surrounded by rolling countryside of orchards and farmland, the small town of Hastings is a quaint, easygoing place with a distinctly rural feel. Chiefly important in New Zealand as a major farming zone, the town has capitalised on this by becoming a foodie center with the weekly Hastings Farmers Market on Sunday attracting large crowds from across the region for its fresh produce and plentiful boutique food stalls. Hastings is also, like Napier, home to a clutch of Art Deco architecture, which is worth a stroll.